Central Oregon’s best cookies, revealed! The winner of The Bulletin’s cookie contest is a bit of a surprise. The top honor goes to 8-year-old Wyatt Chance. His Fairy Drops, shortbread cookies with a peppermint frosting, were simple but well-executed and, frankly, scrumptious. They beat out dozens of other cookies, from chocolate chip to molasses to snickerdoodle. A panel of eight judges sampled the cookies and determined winners in each of five categories. 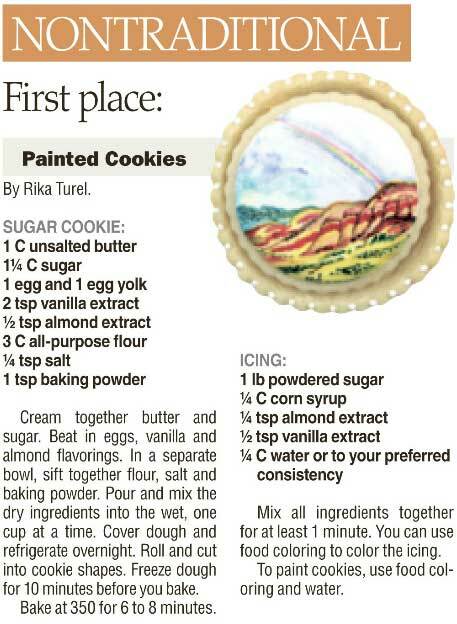 Another standout were the painted cookies from Rika Turel. Her simple sugar cookies were tasty — but it was the impressive painted scenes of Central Oregon that really wowed us. Her cookies were truly works of edible art. The Bulletin would like to thank all of this year’s participants and judges for making it another great cookie contest. More award winning cookie recipies and information about the annual central Oregon cookie contest can be found within this article on the Bulletin website.